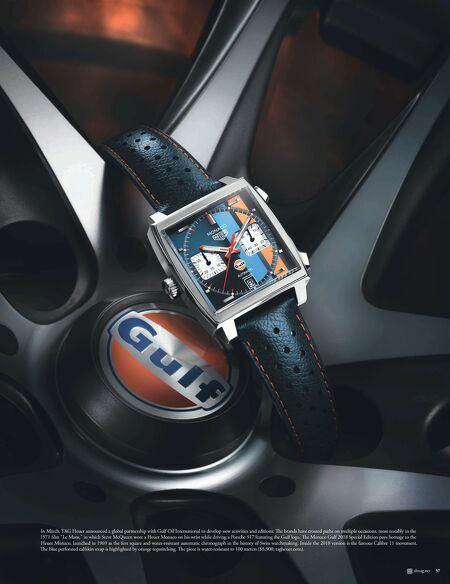 Top-tier watchmakers v ying for pole position look to high-octane performers in the motoring world for inspiration. Compiled by Andre James 56 slmag.net Left to right: To commemorate their appointment as the Official Partner, Official Watch Partner and Official Connected Watch Partner of Aston Martin and Aston Martin Racing, TAG Heuer presented two special editions honoring the British luxury brand at the International Geneva Motor Show this past March. Shown is the 43mm Formula 1 Aston Martin Racing Quartz Chronograph with notched steel bezel and an aluminum ring with a tachymeter scale. e indexes, seconds hand and Aston Martin's winged logo all sport Aston Martin Racing's specific shade of lime. e movement is accurate to a tenth of a second and is displayed on the small counter at 6 o'clock. 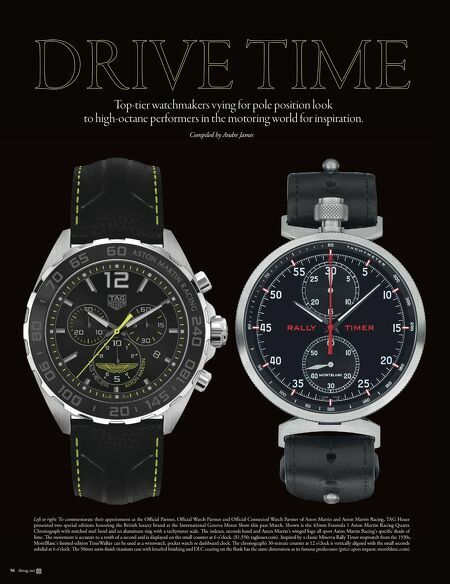 ($1,550; tagheuer.com). Inspired by a classic Minerva Rally Timer stopwatch from the 1930s, MontBlanc's limited-edition TimeWalker can be used as a wristwatch, pocket watch or dashboard clock. e chronograph's 30-minute counter at 12 o'clock is vertically aligned with the small seconds subdial at 6 o'clock. e 50mm satin-finish titanium case with knurled finishing and DLC coating on the flank has the same dimensions as its famous predecessor (price upon request; montblanc.com).